Victor Splash (www.paintpointstudio.ru), St. Petersburg, November 2011. (Assistant artist — Kudasheva Maria). 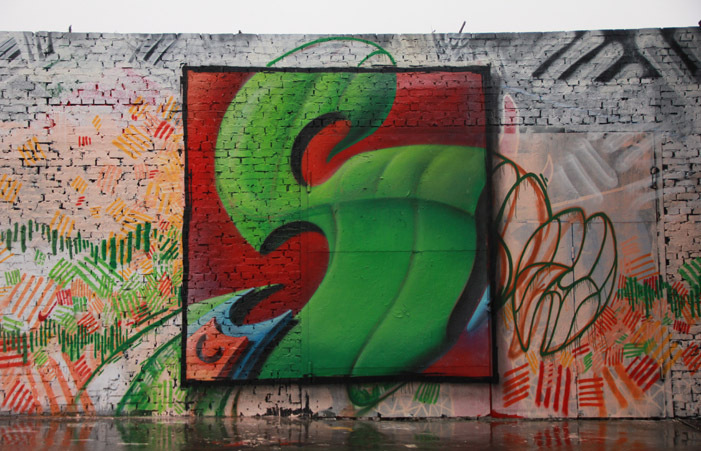 As many he began his artistic career as a “classic” graffiti writer in 1997. Gradually developing his style and improving technique he rather rapidly succeeded in his 3D-lettering experiments, which has gradually become and stays the main author’s specialization. As it has been repeatedly noted by different The Wall Project participants due to the processes of globalization and multiculturalism during the recent 10-15 years in street-art and graffiti field a steady trend for potentially successful authors outflow to related/affiliated commercialized culture spheres: design, modern art, music, street fashion, advertisement (mostly guerilla marketing) etc. can be observed. This trend unintentionally assists the further absorption of the subculture by the mainstream. 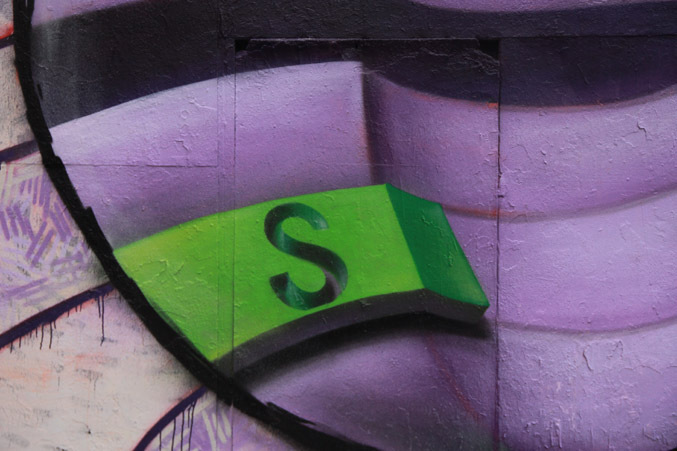 The corporations working for graffiti industry (besides the “related”) often use experience of the acknowledged masters of the genre as leader opinion for developing of their marketing strategies and advertising campaigns offering partner sponsorship, contracts for exclusive designs development etc. 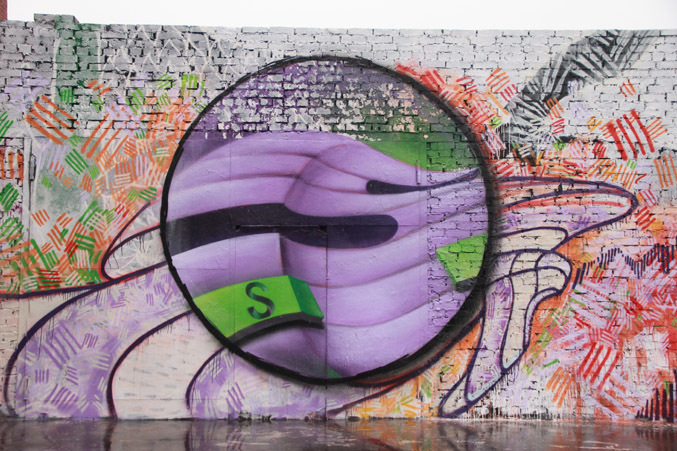 In the West the most successful in such approach are: Сrash, Futura 2000, Can Two, Bates, Sat One, Krink, Shepard Fairey, Os Gemeos, ECB, Getting Up crew, Mclaim crew. 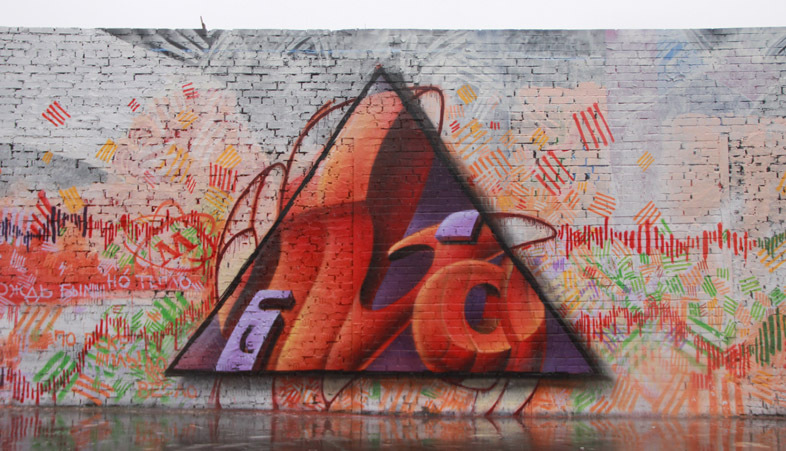 Among the Russian artist we can name Sabotage Crew, Mainstreamers, Karina Kino, Kiosk, Aske, Oskes, True Stilo, Bee crew, Rus crew, Zuk Club, 5nak and others. The artistic activity of Victor Splash is one of the most vivid confirmations of above mentioned — started as an active style writer he gradually switched to graphic design distancing himself from street graffiti and turning it from hobby to career. As a result he is the head of his design agency “Paint Point” focused on modern progressive brands and sponsored by Nike and Molotow. Besides his commercial activity Victor delivers lectures on history of graffiti culture and street-art development at University within an elective course. 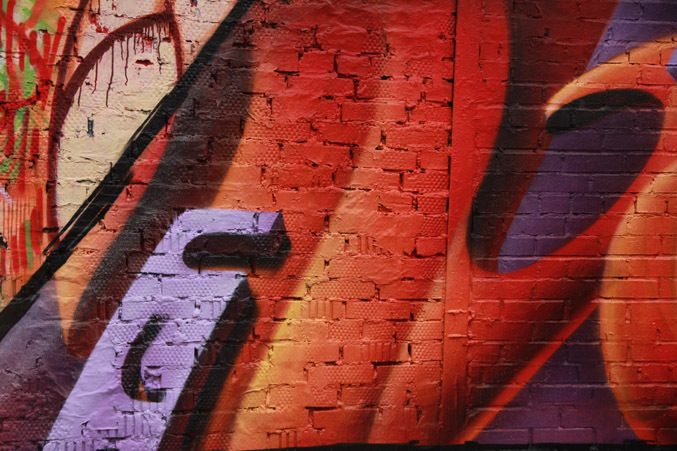 The work represented on The Wall was accompanied by the author’s speech on his becoming a graffiti designer and vividly demonstrates the style of the artist with all the scrupulousness of its performance.